The second installment of C.S. Lewis’ timeless epic has now been released on DVD and Blu-ray Hi-Def, bringing the fantasy adventure that has enthralled millions into homes across America in time for the Christmas holiday. 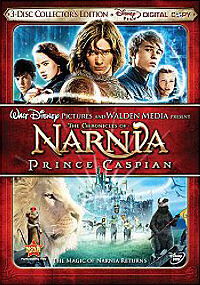 Packed with interviews, exclusive featurettes as well as deleted scenes, the “Chronicles of Narnia: Prince Caspian” DVD is sure to be a DVD you will want to add to your collection. Besides the full-feature length movie itself, the collector’s edition Prince Caspian DVD will offer viewers several special bonuses. “The Chronicles of Narnia: Prince Caspian” has a suggested retail price of $29.99 in the U.S. but is available at Amazon.com for half-price. The Collector’s Edition, meanwhile, is $39.99 (43% off on Amazon), and the Blu-ray disc is priced at $35.99 (31% off on Amazon). While I myself would love to add this to my collection, I think I’m going to wait until all seven installments of The Chronicles of Narnia are completed and available in some sort of box set, just as I did with The Lord of the Rings trilogy. Still, if you can;t wait till Disney finishes production of several more films, the Amazon pricing is looking pretty good right now.